Pawsitive Foundation Dog Training is dedicated to creating a relationship between dog and owner based on respect, love, trust and leadership. We have many different packages to suit all of your training needs and your budget. We are result driven and specialize in creating a calm. balanced and happy dog. Julie is such a natural with little pups. She is friendly and trains the owner while training the dog. So far she has done all the heavy lifting in training our new puppy, introducing the concept to him first then teaching me how to reinforce. I can tell Julie loves her work and she is a joy to work with. Way under priced in my opinion. I am the dazed and confused owner of a ten-month-old Portuguese Water Dog named, Jemma. She speaks fluent Portuguese and understands French, Italian and Spanish. However, she has a serious challenge with the English language. Even the meaning of simple words like, "down," "sit," and "off," elude her. I was nearly ready to give up because myself, family, and friends have not been able to cross the communication barrier. Then my Vet shared a letter with me from another client who owns Jemma's sibling. They were experiencing the same resistance to doggy commands and proper etiquette. They spoke highly of local Newport Beach trainer, Julie Brady, of Pawsitive Foundation Dog Training. I called her shortly afterward and threw myself at her mercy. Julie interviewed us and was willing to work with Jemma. She did not have an opening for three weeks, but got me started with some training tips that started to take effect quickly. Jemma joined Julie in her home for three weeks of training. What can I say? She had a lot to learn! Although I would have loved the dog of my dreams to return to my loving arms, I received the news that although quite intelligent, Jemma is quite stubborn; and the training was going to be a commitment of everyday follow through and periodic follow-ups with Julie. Jemma is grasping an understanding of sit, stay, off, down, place and look at me. This little story is moving towards a happy ending, and may be the answer for other pet owners in the same situation. Julie has solutions if you are willing to commit and work earnestly to develop a mutual relationship of satisfaction for both owner and dog! I highly recommend her. When we got Maggie, a very energetic Springer Spaniel puppy, I knew I needed one on one training. A friend of mine recommended Julie. I immediately signed on for 4 private lessons. After the first lesson, I knew I made the right choice. 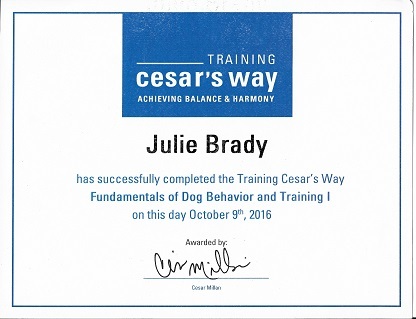 Julie was easy to talk to and she took time to make sure we knew how to repeat what she was training. Maggie wanted to learn and she was always eager for her lessons. Walking her was the hardest hurdle we faced. She pulled me constantly and I like to walk everyday. Julie worked with her and me and trained both of us. I now walk around the island with her and everyone comments on how good she is! Maggie goes to day-training one day a week and Julie picks her up,drops her off and sends you updates during the day. She'll work on whatever you need and send you a video showing how you can enforce what she's teaching. I think the one thing I really love is that she answers any questions I have promptly. It's nice to have someone to talk to when your dog is driving you crazy! I'm so glad that she is in my and Maggie's life! Maggie is seven months old now and still has a lot to learn but we are getting there thanks to Julie! We worked with Julie with her Walk Doctor program. We have 2 labs that liked to pull on the leash and also became very excited if encountered other dogs while on leash. 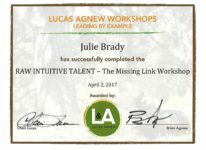 After our first session I was able to implement the techniques Julie taught us and noticed a remarkable difference ! The 2nd session we worked more on being calm when encountering other dogs and around distractions and feel those will be effective as well! I feel a big sense of relief knowing we can be out walking and enjoying the walks and not being pulled in all directions! Julie really seems to understand dog behaviors and gentle ways to correct them! Very thankful for her Walk Doctor program! 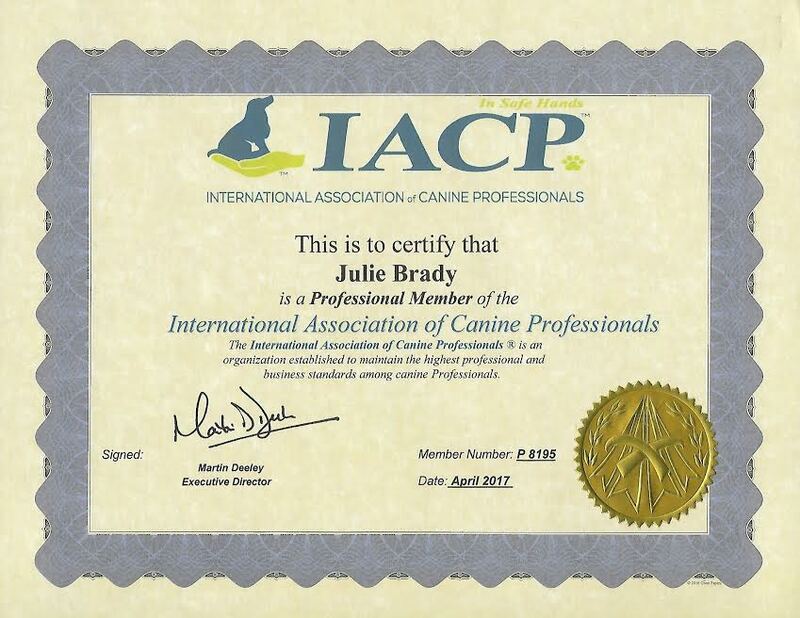 We could not have chosen a better dog trainer than Julie. Since day 1 she has shown nothing but professionalism with us and our puppy Rascal. Not to mention, SHE GIVES YOU RESULTS!!! within the first month of training, Julie got Rascal to sit, lay down, AND go to place!! We take him to our family's houses with other dogs and they are all absolutely amazed at how incredibly well behaved he is. Even when we go out to walk him around, people stop and ask us our secret on how we got him so well behaved. We just tell them to give Julie a call and she will do whatever it takes to get your dog to where you want them to be. Best part is SHES AFFORDABLE!!!! but in our opinion, you cannot put a price on a well behaved dog. Overall, Julie is a tremendous trainer and we recommend her to anybody and everybody we come across. Julie has been working with my bulldogs who are being trained for Therapy dogs. Before Julie my dogs were all over the place. Before I had her when people come over they jump all over them now when people come over they just greet them without jumping. She did place, leave it, door crashing etc. She truly knows her stuff. She's so sweet and any pup that gets Julie is very lucky. She's very patient and kind and she loves all the animals she works with. She just has a big heart and anyone is lucky to have her. She has taught me so much. We all love Julie. We had Julie home board and train our 3 year old yellow lab for two weeks. Before the training, Monty had some pretty bad habits including pulling at his leash during his walks, counter surfing, and barking at motorcycles and skateboards. She really worked hard with our dog and it shows. He now walks by our side without pulling, ignores the motorcycles and skateboards, and stays on his place despite having food on the counter. She spent two hours with us to reinforce the his training and basically train us to be better masters. 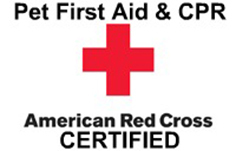 We were very pleased and would highly recommend Julie as a trainer. 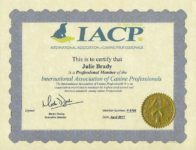 We chose Julie because she offers an In Home New Dog or Adopted Dog Training. We have a dog that has been with us for three years and we were ready to get a second dog. Julie came over the third day with our new dog. She walked us through the training session to help us give the new dog proper introductions and how to proceed moving forward. 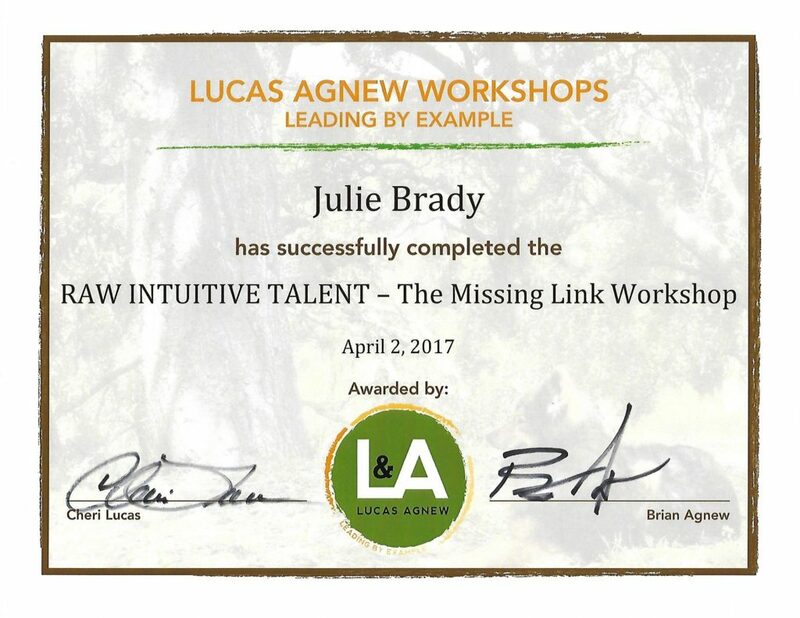 The training and information she left with us proved very valuable. I did not know how much structure was necessary. Julie showed me how to recognize when more structure was needed. The result has been a happy, relaxed new dog. Without her, I would not have known what to look for in my dogs behavior. And I would not have known what to do to help my dog. Currently, we have purchased the Walk Doctor to correct leash aggressive behavior in the dog that we have had for three years. 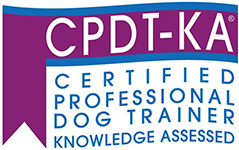 I highly recommend Pawsitive Foundation Dog Training. Julie worked with my chocolate Labrador who is enormously hyper.She has gotten Pasha and I to gain trust in one another. Taking her for a walk used to be frustrating. Now we enjoy our time together and going on walks is fun . Thanks Julie for getting this done in a short amount of time. Julie has been awesome to work with! She is always on time, professional and so good with dogs! Our dog absolutely loves her and her training skill set has been great for him! I would recommend her to anyone looking for in house dog training...her price is right and you can really tell she takes her time and cares. Thank you Julie for all you have done for us! I rescued a lab mix who has some severe anxiety around other dogs especially. Julie has been working with him and after only a few sessions we are already seeing him change dramatically. Before, we would not dare walk him outside for fear of seeing other dogs and now we are actually able to take him out for walks. I can't wait to see how well he's doing after a few more sessions! Julie is the absolute sweetest!! We have three dogs who are mixed breeds of Chihuahua and not sure what else lol. One of our dogs is so sketchy with strangers and Julie was able to have her taking treats from Julie and not barking at her ( never usually happens) gave us tons of tricks and tips that work!! This is my favorite thing about Julie she loves dogs as much as me!! She also has a mixed Chi chi like we do!! Thank you Julie!! Call or email us today to book your consultation or training package. We look forward to serving you!